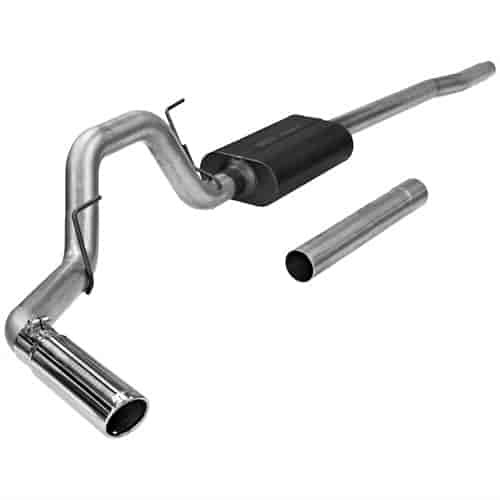 Flowmaster's Force II Exhaust Systems for Truck/SUV's are perfect for anyone looking for some level of performance tone enhancement, but are concerned about installing an exhaust system that is too aggressive for daily street driving. These systems deliver a moderate exterior tone and moderate to mild interior tone and are suited to customers looking for efficiency improvements without a lot of noise. With easy fit in mind, these systems are mandrel bent for maximum performance and flow. Like all Flowmaster systems, the benefits include improved throttle response, power and mileage. Includes all necessary parts and hardware for easy installation. Mild to moderate exterior exhaust tone. Mandrel bent 16 gauge stainless steel tubing. Improved throttle response, power and mileage. Does Flowmaster 17403 fit your vehicle? 17403 is rated 5.0 out of 5 by 1.